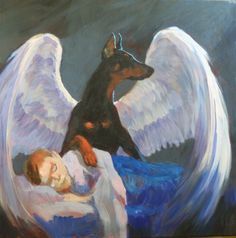 WILL I SEE MY DOBERMAN IN HEAVEN? Upon examining the scriptures we just don’t have biblical support to say this with certainty whether or not our pets will be in heaven, however it does appear that animals will exist in the Kingdom of heaven (Isaiah 11:6-9). If our pets will be resurrected or not, we just cannot say for sure. A more important question is if you, the reader, will be in heaven. It is pointless to ponder the question of whether your pet goes to heaven if you yourself are not there. ​The only way to be sure is to make certain you can go there. Decide today to accept Jesus Christ as your Savior and have the full assurance that you will go to heaven and receive eternal life. As for your pets being in heaven or not, the only way to find out is to go there yourself. That is my prayer for you.